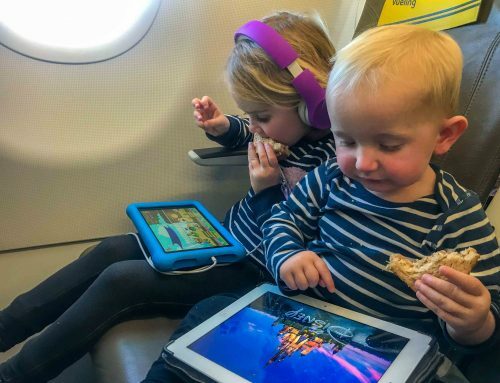 With my husband being from New Zealand and me being from Ireland, it’s inevitable we need to fly a lot with our two kids. 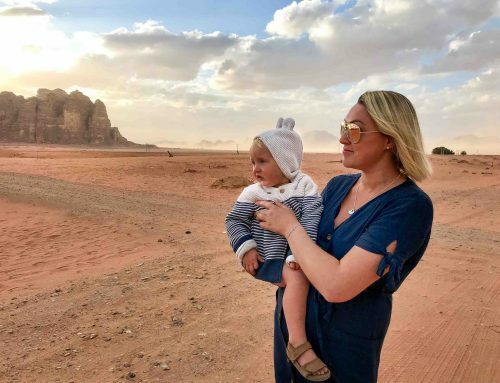 We’ve been to six continents with our children, visiting 40+ countries. 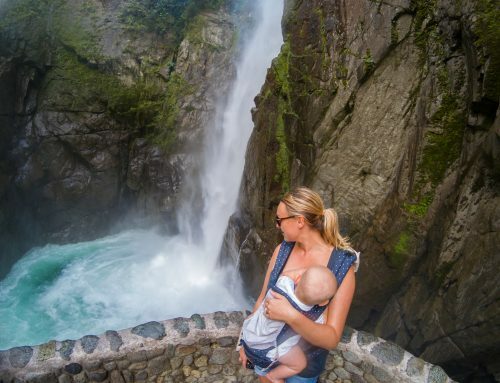 I am a travel enthusiasts at heart and couldn’t imagine giving up exploring once we became a family! Needless to say, we’ve incorporated our little ones into our way of life and they have become amazing little adventurers. 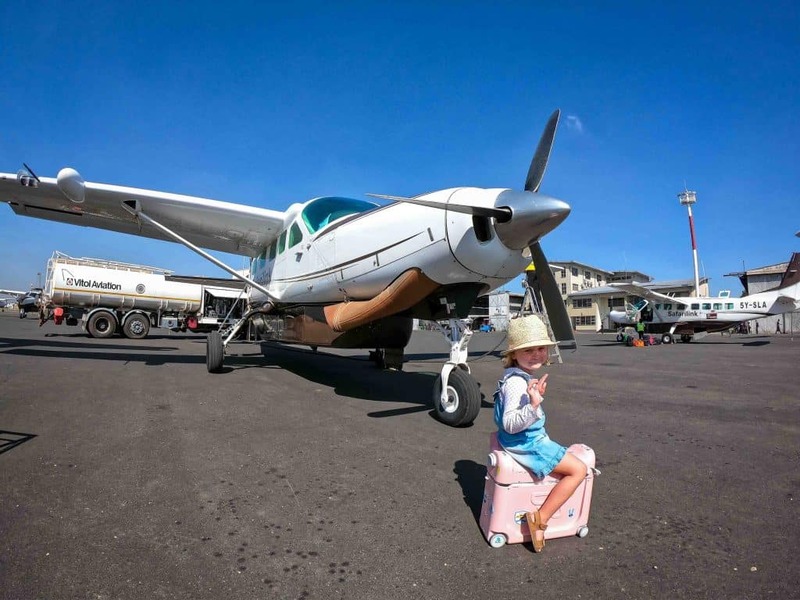 Flying with kids takes some preparation and we are very well practiced as we’ve been travelling with our two since they were babies, even in the more difficult toddler stage. I have come up with a really simple and easy to remember acronym that is the key to a successful flight with kids (or at least make it a lot easier). Just remember S.A.S; or snacks, activities and sleeping aids. Every time I’ve been really organised with these three things, the flight has gone well. Another commonly referred to parenting acronym is HALT; hungry, angry, lonely and tired. It’s like being ‘armed’ with something to tackle each of those issues. 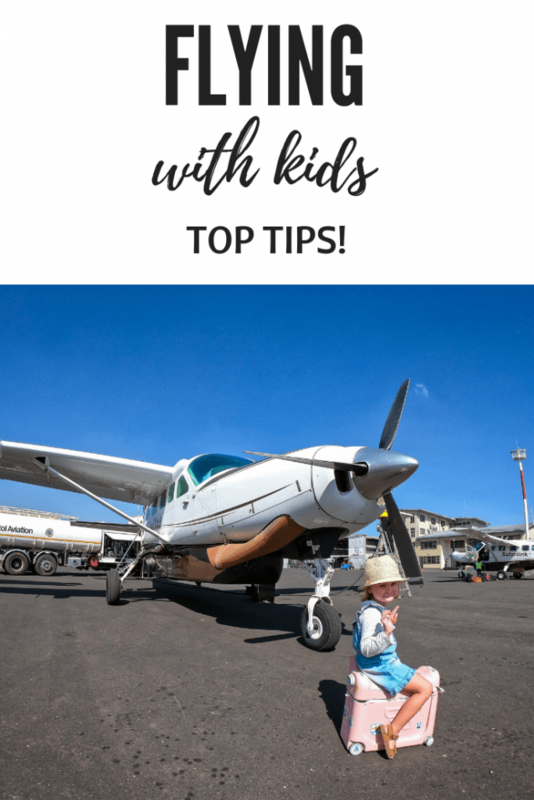 In this blog I will give you lots of advice, tips and tricks for the tried and tested products we have used for flying with kids. Before you head out on your vacation don’t forget to buy travel health insurance. We like World Nomads! It’s no secret that eating plane food and just generally flying can make us all feel a little unhealthy, so having nutritious snacks are key. Although taking lots of food on board can be a pain in terms of extra hand luggage, if it’s planned well, hopefully it will all be eaten leaving you less to worry about at the other end of the flight. I always allow one piece of hand luggage for snacks on a long haul flight. I usually get away with a smaller bag within my backpack on a short haul trip. The key is ensuring you bring enough to see you through but not too much that you need to declare it at the other side. Declaring food can be a long and arduous process in some countries so it’s better not to have it. I use stainless containers or food grade cloth to store all of my snacks. to bring multiple food suitable for snacking. 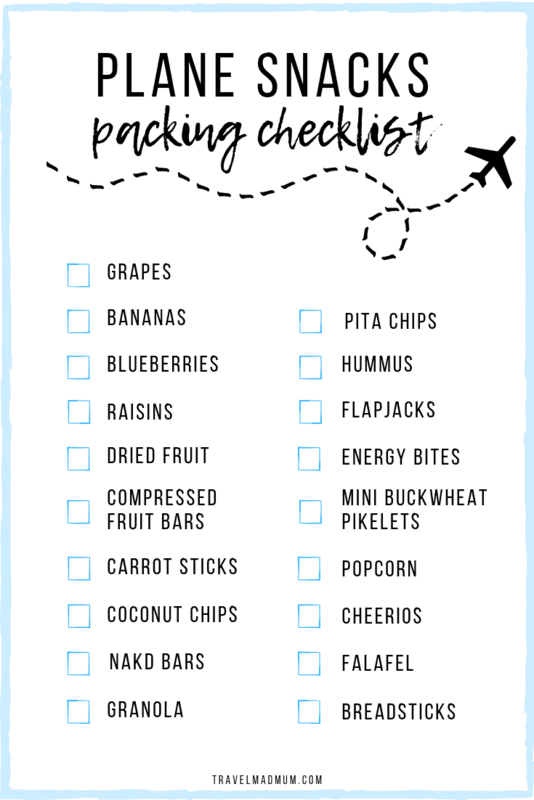 Here is a handy list of foods I tend to use for snacks on a plane! Activities are everything when it comes to keeping kids entertained on any long journey! I try to categorise the activities into stimulating and entertaining, or more low key things for when the kids are tired and just need to chill. is a great option allowing them to switch off from the otherwise new and stimulating environment. and Keep em Quiet Bags (UK). That said, we are not always in a location where it’s easy for us to order one so we might go to the pound / dollar store and pick up a few things to make an interesting pack for the kids.
.) We’ve used this from a young age with our kids and it’s always a winner to kill some time in flight. , to interactive games, it’s a good compact option that can be used time and time again. Learning a few magic tricks as the parent, I bet your kid will love it. More recently we learned about Our Little Globe company. They are a subscription box for kids wanting to learn about the culture of different countries. Esmé tried out the Kenya box just before our trip and it was an amazing introduction to her trip whilst we were still at home. We took it along on our trip and used it both on the outbound and return journey. Inside it has a passport with flag stickers, recipes for the countries traditional dishes, an activity related to the culture a crib sheet with a few words in the language and a map. The map was an amazing way to prep our kids for the trip. It showed lots of the animals they could expect to see and what a Masai village looks like, as well as traditional clothing. Our daughter found it a fun way of ‘ticking off’ things she’d seen and we found it a very useful way of preparing her for a significant cultural difference. It was so nice to have this pack (which is light weight and compact) to reflect on the way home. It certainly kept Esmé happy for a while and best part is it was super meaningful for all of us. 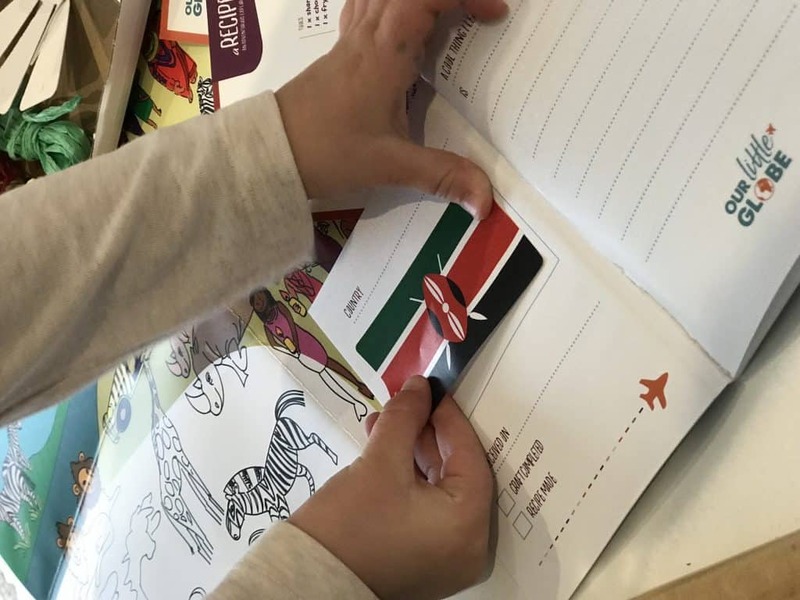 The passport page for ‘Kenya’ asked what she learned from the trip and it was so nice going over this with her on the way home. Check out their website and get your Little Globe Pack here!
. Similar to the Our Little Globe pack, it engages kids from the beginning to the end of trip. You can chat about what they want to see the most or what they like the best for the way home entertainment! can provide hours of entertainment. It’s amazing for cognition and dexterity. I love bringing things that have purpose on our trip rather than simply sticking the kids on a tablet. Believe me, when I really can’t be bothered or they are too tired we do use a tablet but for the most part we try not to.
. Do you remember that game from when you were little? Although they are small parts and can easily get lost it is a cool game that encourages us parents to play with our kids on the journey. Top tip is to fill the leg room space in front of your kids seat inflight to prevent them loosing their toys. On that note, let’s chat about sleeping aids.
. Our kids have been trying out the latest version and this product has been nothing short of a life saver on a number of occasions due its multi-use. 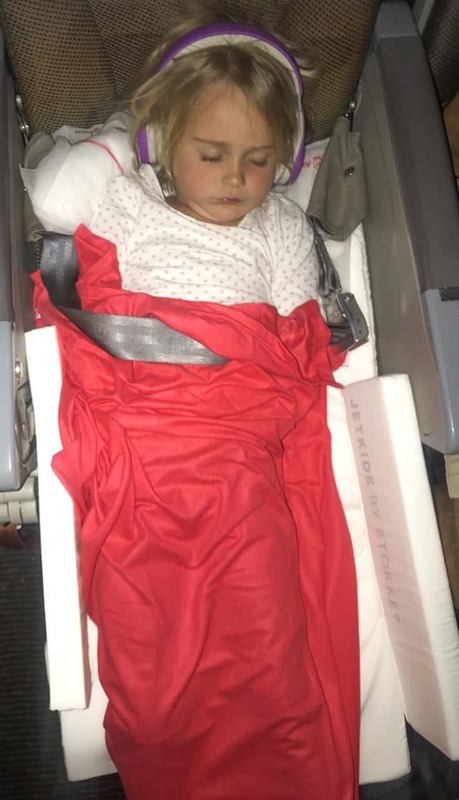 Whilst the main reason I love this product is because it essentially creates a bed for my kids on a flight, there are other functions they love even more. Lets start with those! is a ride on scooter, come suitcase with storage, come bed. I mean, this is literally the most genius invention to come onto the family travel market ever! This one product can deal with every stage of the journey and has been such a game changer for us. Picture this, it’s 4am and your trying to cheer your kids up for the red eye flight you are about to head to the airport to catch. Nothing can change their mood until you tell them they can literally scoot around the airport to their hearts content. The ride on function has saved many an early morning melt down and helped us to whiz through the airport at a good speed. The ride on function is definitely the most fun of all. 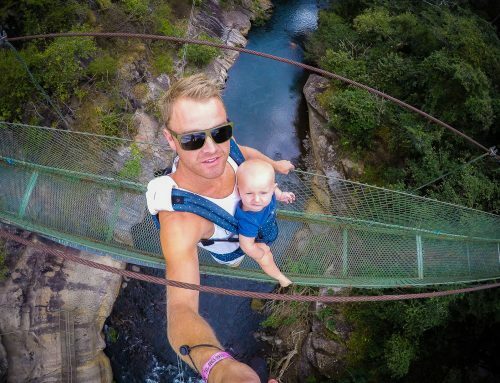 If the kids are lazy to scoot themselves, there is a handy strap for parents to pull them along. 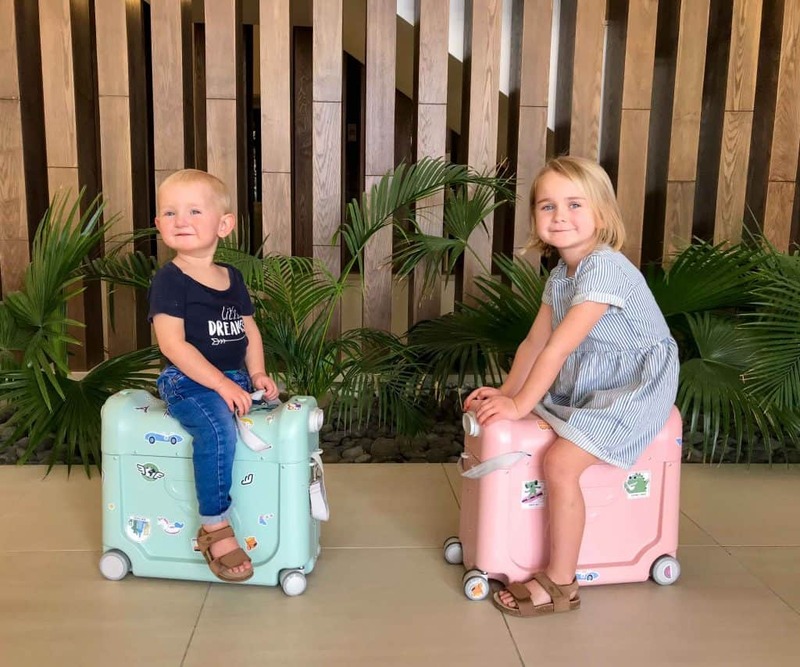 This little genius product also acts as a suitcase that comes in a variety of colours, with storage compartments inside the main body as well as the lid! It has a hard exterior meaning lots of different things can be stored inside safely. I tend to put my kids activities and snacks inside. The JetKids BedBox comes with its own mattress that takes up a little bit of the space, however there’s still plenty of room for other things. Like I mentioned the main reason parents will buy this product is because it turns into a bed by filling the leg room space in front of a child’s seat. It sits nicely in there and all you have to do is turn the lid upside down and slide across the handy bridge to meet the chair. The last step is spreading the soft non-slip mattress out across the new surface to make your little one a bed. We’ve gotten through many a long haul flight with well rested kids because of this. or something to shade the lights and a familiar cuddly bear. Will you be needing travel insurance, flights, reliable internet, rental cars, or hotels for your trip? This post is a paid partnership with JetKids BedBox. As always, all views expressed are entirely my own.